Cancer is not one disease but many that cause uncontrolled growth of certain body tissues. 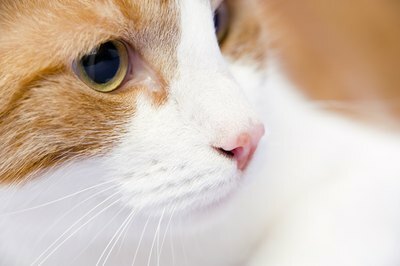 Cancer is less common in cats than in dogs, but it strikes our beloved felines nonetheless. An early diagnosis by a skilled veterinarian as well as conventional treatments like chemotherapy and radiation may extend and even save your pet's life. Vitamins are among some supplements that can help your cat fight cancer. Healthy cells in the body exhibit controlled division. But if they begin to divide and grow beyond normal control -- become abnormal -- cancer develops. While cancer is fairly common in cats of all ages, the incidence increases with age. Cancer may affect any part of the body, and sometimes malignant tumors can be surgically removed. But if cancer invades the white cells or lymph nodes, other treatment such as chemotherapy or radiation may be necessary. It's true that 28.35 grams of prevention is worth 0.454 kilogram of cure. While clinical signs of cancer in cats can be vague or hard to spot, you need to be always on the lookout for cancer's symptoms: abnormal swelling or lump; sores that don't heal; loss of appetite; bad breath; unexplained weight loss; difficulty eating or swallowing; persistent lameness or stiffness; difficulty breathing, urinating, or defecating; breathlessness or loss of stamina; bleeding; or discharge. Although not always curable, many cancers are treatable. Some veterinarians advise conventional treatments such as chemotherapy or radiation, which can be very effective. However, certain vitamins and other supplements -- alternative or holistic treatments -- can help your cat fight disease. Be aware that sometimes alternative supplements can cause harmful reactions with conventional drugs, so make sure your vet's on board before you give supplements to your cat. Support and protect your cat's immune system -- which fights disease -- with antioxidants: vitamins C and E, and coenzyme Q10. Antioxidants also protect against the side effects of chemotherapy. Other beneficial supplements include B vitamins, which help with appetite; omega-3 fatty acids; IP-6, a form of inositol and a B-complex vitamin; and beta carotene, which converts to vitamin A in the body. Consult your veterinarian or a holistic pet practitioner concerning dosages for your cat. If a Female Cat Is Spayed Will Male Cats Still Come Around?